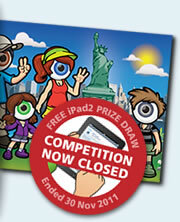 A big thank you for entering our FREE competition to win an Apple iPad 2! We asked you to name the city that the Eyebrights visited on holiday, and we had a fantastic response. The competition is now closed, and the winner has been notified. Don't worry if you were not the lucky winner as we have another fantastic competition for you. 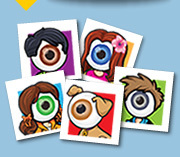 Another great chance to win an Apple iPad 2 before Christmas, with our Bigger Picture competition! Can you find the answer to our Bigger Picture competition? 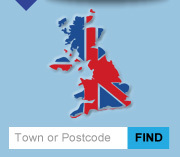 Use our "Find a local Optician" tool to find your nearest SPECS Network Optician, then simply visit your chosen location to match the jigsaw piece to a Bigger Picture; it will be readily available for you to view. Once you have found the answer, please return to the SPECS Network Website to enter. Good luck! The value of a thorough eye examination! A visit to her Optician saved a little girls life, after doctors failed to detect she had a brain tumour. SPECS Network Optician, Jack Levin, located in Potters Bar, Hertfordshire, detected the life-threatening tumour and the very next day, little Serena endured a gruelling seven hour emergency operation to remove it. She is now back at school after chemotherapy and radiotherapy. 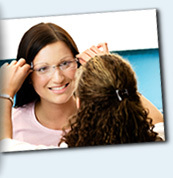 Ever thought what it would be like to not have your specs or contact lenses for a day? It is like that every day for many people who live on our streets, here in the UK. It is very easy to overlook good vision when you have it, but as soon as it is taken away, even for a short time, it makes us realise how important this vital sense is to us all. 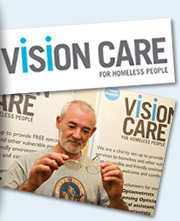 Now, a charity, which currently operates in London and Birmingham, but with plans to be in more of our cities, is addressing the problem with eye checks and glasses provided for the homeless. You have received this email from SPECS network because you either entered a competition or signed up to our mailing list. This email campaign is sent and managed using Kent House MailManager.